The perfect world is in my head. I have a feeling that some of you have tried my tutorials and then thought “This is a 3D tutorial, but why is everything in 2D?”. So in this tutorial we will make some real 3D meshes. This is also necessary for the following tutorials. When I started I had problems with finding out how to programmatic make different meshes like cubes, cones and so on. I needed this so I easy easy could put my scenes together. So this tutorial will show how to make some of the basic primitives. They might not be the most effective way of creating them but it is a way of doing them. Starting point will be from the source of the second tutorial. I will show you plane and cube and then give you a couple of hint for additional primitives. Let’s start making out pattern. It’s a good idea to have a common base for your meshes. So let us start by creating a class called Mesh. // The number of indices. // What faces to remove with the face culling. // coordinates to use when rendering. // Enable the color array buffer to be used during rendering. // Point out the where the color buffer is. // Disable the vertices buffer. We need functions where the subclasses can set the vertices and the indices. These function contains nothing new and are pretty much the same as you seen in earlier tutorials. // Setting the flat color. // float has 4 bytes. And use them in the draw function add this lines just before the gl.glDrawElements call. Let us start making a plane an quite easy task you might think and it kinda is. 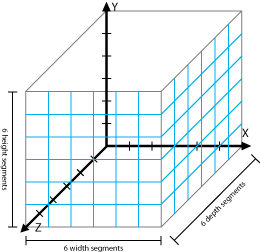 But to make it more interesting and more useful we need to be able to create it with some different settings like: width, depth, how many width segments and how many depth segments. Just so we have the same terminology, width is the length over the x-axis, depth is over the z-axis and height is over the y-axis. Look at the image below as a visual input. Segments is how many parts the length should be divided by. This is useful if you need to make a surface that is not total even. If you create a plane over x, y and make z not all be 0 say you give z a random span from -0.1 to 0.1 you will get something you could use as a ground plane in a game just put a nice texture on it. Looking at the image above you see that the different segments gives you squares. Since we like it to be triangles so just split them up into 2 triangles. // Gives you a plane that is 1 unit wide and 1 unit high with just one segment over width and height. // Let you decide the size of the plane but still only one segment. // For alla your settings. The one to the left shows the segments and the one to the right show us the faces we need to create. The next step I think a cube will be nice. I will only make a cube that you can set: height, width and depth on but I suggest you as a practice make it with segments just as we did with the plane. And since I’m not doing this with any segments the constructor will be quite easy. 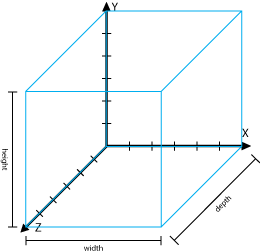 Make the renderer work with a group as a root node and add your cube to it. It’s always a good idea to have different primitives ready to use when you starting up a new project. My experience tell me that in 9 times of 10 you won’t have any meshes from the graphic people when you start coding so it’s really good to have some meshes to work with as place holders. I’ll give you a hint of the way to start with your own meshes library by giving you an idea of how I would do it. Creating your own meshes is a really good way of getting to know vertices and indices really close up. After you have gotten your cube up and ready to go my suggestion is that you move onto a cone. A cone with the right settings could be more then just a cone. if you give is 3-4 sides it will be a pyramid. If you give it the same base and top radius it becomes a cylinder. So you can see why it is so useful. Take a look at this image and see what the this cone can do. Dividing up surfaces is a good thing to know about and by now you know how to divide up a regular square. To divide up a triangle look at the images below. It is a bit different and it might be a bit harder to implement. Your information is very useful for android developer. I am very happy to read your blog. It’s been very beneficial.